The crucial role played by video games in contemporary culture is increasingly being noted by scholars of the phenomenon. Attention is being paid to the fact that aside from their obvious ludic and entertainment function, they also carry out other tasks and have a significant influence on other areas of contemporary art. The relative “youth” of the phenomenon (the first computer games designed for popular use appeared in the 1970s) and its rapid-fire development, closely linked with the development of new technologies, make it an extremely interesting, though difficult, object of study. Despite the fact that the state of affairs has changed radically in recent years due to the increasingly dynamic activity of scholars specializing in phenomena within the sphere of new media, scholars of video games still find themselves challenged to some extent by the need to justify the relevance and importance of a phenomenon from the domain of “low-brow entertainment,” burdened with negative connotations (the problems of violence and addiction) in scholarly studies. Additional and perhaps more important difficulties in terms of methodology appear in the form of the rapid and ever-shifting development of technology (the working categories developed to describe games at the dawn of the twenty-first century frequently reveal themselves to be inadequate for describing the games now being created), as well as the need to elaborate appropriate tools and categories of description for a phenomenon that eludes, in terms of both concepts and content, the conceptual apparatus and theories used in previously existing fields. An awareness of this problem was one of the foundations of game studies or ludology – their fundamental goal was to free the discourse of the study of games from the categories used to describe other phenomena and to develop a suitable methodological apparatus that would allow the specific nature of the phenomenon to be captured in categories exclusively proper to the new field. The dispute that arose between ludologists (proponents of seeking out new tools and scholarly categories for the description of games) and narratologists (who believed that games should be studied using traditional categories from the study of texts and narratives and that such a methodology was sufficient) has been described in detail in the literature on the subject. In the introduction to his outline of the poetics of video games, however, Piotr Kubiński underscores the facile, superficial nature of that dispute. Taking a broad scholarly perspective and an admittedly eclectic (in its methodology) and interdisciplinary approach, Kubiński in Gry wideo. Zarys poetyki (Video Games. Outline of Poetics) rightly asserts that the complexity and uniqueness of the phenomenon of video games demand the application of a variety of tools and solutions, depending on the aspect of the phenomenon on which we intend to concentrate our inquiry. The “poetics” of the title here should not suggest that the work limits itself to using only the traditional instruments of literary studies. 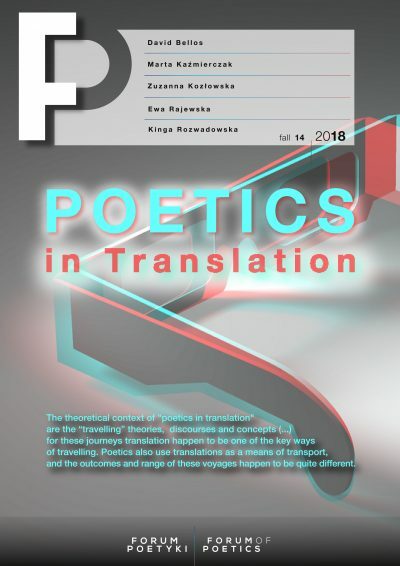 Kubiński invokes the contemporary understanding of poetics as a tool appropriate to the study of various forms of textuality, simultaneously adopting a very broad understanding of text that allows him also to include within its scope categories not found within the area of interests of classical literary scholarship. Here, it should be noted that in his analysis of various elements of the poetics of video games, Kubiński does a perfect balancing act, both accenting the kinship between the solutions applied in games and procedures used in other artistic fields (cinema, literature and painting), and revealing important differences that testify to the unique nature of the devices described. This equilibrium, such as his explicit use of a variety of theories from literary studies and other fields, combined with knowledge in the area of information technologies, enable him to perceive significant efforts aimed at constructing descriptive tools that will make possible a discussion of video games, already an important element of contemporary culture, as a phenomenon that is unique but also rooted in tradition and draws from it in a great many different ways. This emphasis on not only the ludic but also the artistic value of the games analyzed is also a crucial observation that situates the phenomenon at the centre of contemporary culture. Kubiński begins his proposal for a scholarly tool for describing video games with a discussion of the phenomenon of immersion, which he, in accordance with many scholars, finds to be a constitutive element of the poetics of video games. Operationalizing some concepts used by scholars of such games and undertaking an attempt to settle some doubts as to terminology (differences between the concepts of telepresence, immersion and incorporation, as well as differences in definitions of immersion as such), Kubiński decides to define the phenomenon as “an expression of unmediated participation, direct presence in a digital space generated via computer.” He underscores the importance of the player’s “possession” by works of an immersive nature: the fact that the world of the game absorbs the user, “tearing him away from” extradigital reality. Kubiński, sticking to his adopted strategy of balancing between the similar and the dissimilar, does not posit a strong thesis asserting that immersion is limited exclusively to the domain of video games. He cites remarks on the immersive properties of other fields of art and the impression of absorption, whether created by a literary text or a filmic work, at the same time searching for what might be treated as exclusive to video games in order to avoid blurring his concepts. To a considerable degree, this allows him to differentiate and discuss in detail the factors that shape the sense of immersion in the world of video games, among which are: the impression of unmediated experience, the illusion of direct participation in the game, ergodic elements, the kinetic dimension of the player’s activity, and the reliability of the technologies used. A crucial point is Kubiński’s observation that in the case of a video game, achieving the impression of immersion does not require an effort to convey an illusion of reality that corresponds to the original in a relationship of 1:1 equivalence, an effect which might increasingly be made possible by developments in technology. Textual games based strictly on an exchange of messages conveyed via an internet platform or the simplest hand-eye coordination games can have, in keeping with this reasoning, just as high an immersive potential as those that are visually and technologically elaborate, complex simulations of alternative worlds. It might seem that the emersive elements in a computer game would include primarily mistakes and lapses of a technical or systemic character, constituting technological limitations. Kubiński broadly discusses the problems relating to the façade created according to the needs of the game’s design, which in certain circumstances can, accidentally, become apparent, deformations of characters or elements of the diegetic world not justified by the plot or, for example, the familiar situation in which a character walks into an “invisible wall,” reaching the boundary of the map that represents the “end of the diegetic universe.” Kubiński describes phenomena of this type using the term technical disillusion, correctly noting that they can take the form not only of errors or technical imperfections, but also can serve to fulfil deliberate artistic purposes, which is considerably more interesting. He mentions the example of the game Batman. Arkham Asylum, in which an apparent mechanical error (the familiar lines on the screen accompanied by the corresponding sounds suggesting an equipment failure, and the apparent restarting of the game after a short while) in fact constitutes an element of the plot, illustrating the perception of the protagonist, who has been poisoned by toxins and is experiencing hallucinations. This effect unmistakably elicits surprise and “extraction” from the rhythm of the game (particularly if the player fears that the progress through the game he has managed to achieve is going to be irretrievably lost due to a mechanical failure), thus bringing to mind (the similarity is noted by Kubiński) the effect of “making strange” (остранение), an idea introduced by Viktor Shklovsky and one of the key theoretical categories in Russian formalism. It opens a wide field for interpretation, even if it constitutes an element of the game’s presentation which Kubiński himself treats as primarily popular and ludic in character. It has meta-medial potential – it is curious that the reaction of the hero’s mind, subjected to the influence of toxins, resembles the reaction of a broken machine – this may suggest a certain level of cyborgization in the protagonist. To describe other categories of emersive phenomena, Kubiński uses another category from literary studies, that of irony or rather ironic distance, invoking the concept developed by Zofia Mitosek. He sketches out a situation in which, within the story of a game, distance is created toward the text as such, an ironic display of its textual character, by means of reference to extratextual reality. Here Kubiński cites the example of the Polish game Wiedźmin (Warlock), in which references to popular songs (such as Stanisław Staszewski’s “Celine”), the political situation (mentions of Poland’s ruling Law and Justice party) and the history of philosophy (the names Søren Kiergegaard and Martin Heidegger), figuring as words in the elves’ language without being removed from the course of the game’s narrative action, cause a peculiar kind of “withdrawal” from the diegetic realm into the real world. Such references cannot be legible to the characters (though they are in fact spoken by their lips), but are to the player. As Kubiński observes, a singular transformation of the communicative model takes place here, as there appears a kind of sender who is not a character and whose consciousness approximates that of the player, enabling him to place in the mouths of the characters messages that elicit an effect of surprise or a humorous effect. Another technique for creating emersion that Kubiński identifies is “breaking the fourth wall” (his use of this term, which appears highly apt in context, shows yet again that in constructing his argument, Kubiński is constantly invoking traditional categories and tools, inscribing video games within a certain cultural-medial continuum). That is a situation where a game character turns directly to the player, for example to explain the rules of play to him or to elicit a humorous effect. Here again, a certain tension on the border between immersion and emersion is involved, which can be shown using the example (not mentioned by Kubiński) of games based on J.K. Rowling’s Harry Potter book series. In these games, instructions for casting a spell are given by teachers during a lecture that the player must attend in order to finish that stage of the game (effect of immersion – we are plunged into the created world as pupils at Hogwart’s). At the same time, however, those teachers, instead of instructing the player in how to operate the magic wand, as they did in the original book, here refer to how to use the tools the player has at his disposal (e.g. clicking on the mouse), an emersive effect, albeit one that seems, to a certain extent, camouflaged. Elsewhere on that borderline, we find situations where the user or player is addressed by means of a “wink of the eye,” intended to have a comic effect or an effect of surprise, or simply to play with conventions (like the behavior of Deadpool in the game Marvel vs. Capcom, mentioned by Kubiński). In his discussion of emersive effects, Kubiński also mentions devices in games that work with narration dynamics and the reliability of the narrator – the example he invokes is in the game Call of Juarez: Gunslinger; in a situation where the protagonist of the game is also its narrator, the user perceives that the narration affects the situation being presented – the narrator’s utterances acquire a performative aspect, having a real effect on his position. The introduction of the category of the unreliable narrator here represents another bow toward classical literary theory and scholarship, but which also fits perfectly into the poetics of video games. A highly significant concept introduced here which allows the specifics of the medium to be grasped while simultaneously taking traditional categories into consideration is that of the palimpsest attempt, Kubiński’s term for a situation in which various plot trajectories become “superimposed” on each other, resulting from the possibility of recording the state of play (allowed by most complex adventure or platform games) and then playing through a certain stage once again. If the character dies in a clash with a more powerful opponent, the player activates the game again at the relevant level and, being aware of the approaching clash, is better prepared for it, changing the course of how the action develops. Operations of this type can also allow simultaneous exploration of multiple variants of the plot (at a moment when its development is influenced by certain decisions on the part of the player). This creates a unique narrative result, in which the course of the narrative arising “at the surface” is in a sense dependent on those record “underneath the surface,” being simultaneously an emersive signal that brings into relief typical features of the medium, thus violating its “transparency” and impression of being unmediated. After the exceptionally interesting chapter on emersion, Kubiński continues to use the tensions he has outlined at the line between immersion and emersion, describing types of graphic user interfaces that are used in computer games. He proposes his own type of classification for such interfaces, dividing them according to the criterion of the diegetic and spatiality, as well as the subcriteria of the diegetic aspect of communication, the contextual filter, and dynamic iconicity. In view of the vast extent of research material and ongoing technological development, it is difficult to state with full certainty whether this classification is exhaustive, but each of the categories listed is here illustrated with appropriate examples and described in a way that shows the operation utility of the division in question. The author divides interfaces into: superimpositions, metarepresentations, situational filters, spatial interfaces, diegetic messages, semeions and metainterfaces. At the same time, he shows that an interface as such will naturally be emersive in character, because it is a tool that enables human communication with a machine, providing information relating to the diegetic world, in many cases (especially where superimpositions are concerned) functioning as if somehow “adjacent” to the reality of the game, while remaining closely connected with it. The emersion effect can for example be made smoother, primarily by metainterfaces – an extremely interesting phenomenon, pointing to multilayered metatextualrelations in video games. Metainterfaces are interfaces that function within the world of the game (i.e. tools that enable the protagonist to communicate with the device he is using, and simultaneously allowing the user to obtain information about the diegetic world). If the protagonist is a cyborg (an example used by Kubiński) who uses special lenses that provide him with information about objects in his sight (importantly, he acquires them only at a certain level of the game), this information is relayed to both the character and the user, becoming a kind of “multi-level” interface. This not only leads to a decrease in the effect of emersion but also has an aesthetic, artistic effect and offers enormous interpretative potential. Kubiński also describes strategies used by game creators to reduce the emersivity of interfaces, such as minimalization (keeping the interface’s elements to a minimum to achieve the lowest possible degree of hindrance to immersion), stylization (elements of the interface are stylized after parts of the game’s represented world, though they do not constitute that world – an intriguing example of this is the stylization of the interface in the game FIFA 15 to imitate a televised transmission of a football match – showing the complicated and multi-layered relations between the two media), diegeticization (incorporation of the interface into the diegetic world), configurativity (the possibility for the user to set the interface) and thematization (use of the interface as a significant element in the playing of the game). The usefulness of the distinctions and classifications Kubiński makes seems to be proven by his minute analyses and interpretations of a great many cited examples. Kubiński surveys a variety of game genres (adventure games, “brawling” games, platform games, simulators, shooting games), directed at various audiences, and whose creators naturally have resorted to widely varied artistic solutions. The expanded exemplification, in addition to being an undeniably strong asset in proving the wide applicability of the proposed interpretations, allows readers to become acquainted with many different phenomena from video game culture which they may not have encountered previously (this is particularly valuable given the overwhelming bulk of research material), but also constitutes a stimulus to submit games with which they are familiar to the proposed categories to “test out” their functionality. In the final chapter, Kubiński presents some selected examples of the influence of the poetics of video games on other cultural texts and phenomena. Starting from an analysis of works of playable literature, he takes us through a short description of the phenomenon of gamification, to a detailed analysis of two examples of games from the genre of engaged games. The necessary limitation of the scope of analysis and description to certain perhaps particularly interesting (or in which the author is particularly expert) phenomena, to which Kubiński directly draws our attention, seems incredibly important here. Taking into account the minute exactitude of the analysis of particular examples and the intriguing conclusions, the reader feels a certain hunger for more after reading the book’s last chapter; but the decision to delineate and open further areas of scholarly reflection in the area of video games seems a worthwhile move, to say the least. For his examples of playable literature, Kubiński analyzes the works Nokianor Parra and Laberinto Borgiano by B. R. Moreno-Ortiz. The author’s classical works of literature are here linked with some almost equally classical games of simple coordination: Snake, a game played on Nokia phones, and Pac-man. In the first case, the text develops together with the progress made in the game by the user (the snake eats pellets, as in the original game, building its body from the letters that create the work being presented); in the second, Pac-man eats the a’s, while Borges’s original work builds the walls of the labyrinth. An analysis of these playable works enables Kubiński to extract particular meanings etched in the collision of literary phenomena with games, and also their potential to produce specific artistic effects (here, following Kubiński, we should underscore that the way of reading and interpreting playable literary works diametrically contrasts with a traditional linear reading, though it does not invalidate it, but rather introduces a certain astonishing variant form). Further along, in his analysis of the problem of gamification, Kubiński describes the functioning of the popular e-learning platform Moodle, which uses a system of points and rankings in a program intended to facilitate the distribution of academic materials and support the learning process at the university level. The question of gamification is merely signalled here, however, a fact of which Kubiński is conscious, broadly citing the literature on the topic and encouraging further inquiries in that area. 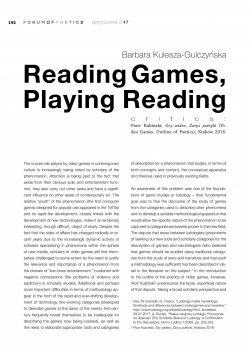 On the other hand, Kubiński offers detailed analyses of chosen examples of engaged games, i.e. games in which the ludic function is, in some sense, subordinated to a journalistic or activist function. Submitting to reflection two simple internet games (Raid Gaza! and Save Israel) that have taken form in connection with the long-standing Israel-Palestine conflict in the Gaza Strip, Kubiński highlights the particular properties of games of this type which make it a significant instrument of social action. Irony, the constitutive feature in particular of the first game (Israel, as the side in the conflict embodied here by the user, has a considerable advantage based on the mechanics of the game, and in case of problems, can ask allies for financial aid, which makes the result of play practically a foregone conclusion), and potent messaging that results from it, as well as the games’ wide availability (being distributed via the internet) and relatively low cost mean that we may expect engaged games to become to a still greater extent a relevant force in public discourse and a significant tool of social action. Such games are, however, also highly controversial (which in a sense heightens their potential ability to raise consciousness) – Kubiński does not touch here on the question of the risk of possible user failures to grasp irony or reach any level but the surface one (perhaps in the case of these examples, the irony is so explicit that the risk is quite marginal), which could distort the final message substantially. An undeniable feather in the author’s cap is earned, above all, by his skilful presentation of the dependencies between video games and other cultural phenomena, while at the same time persuasively clarifying the areas that constitute their singularity. His free use of categories from various scholarly fields and theories does not elicit an impression of methodological inconsistency or eclecticism, but rather of conscious adaptation of his scholarly apparatus to the complexity of the material being explored. The wealth of examples Kubiński analyzes in depth here, which, crucially, are accompanied by abundant, detailed, and clearly annotated illustrations (mostly, but not only, screen shots of games), permitting readers not familiar with the phenomena being described to imagine them with greater ease, seems extremely important as well. A key category and definitely the most arresting element in the argument would appear to be emersion and its consequences for the poetics of video games, although his analyses of the problems of interfaces and signals in playable literature and advanced games represent a no less valuable contribution to scholarly research in this area. Kubiński’s presentation puts forward a fascinating proposition for a conceptual apparatus and tools that can be used to describe and study video games, while at the same time allowing readers to become acquainted with many phenomena from this area of culture, to learn about its complexity and variety, and to perceive its potential not only in ludic, but also in artistic and journalistic terms. In his book Gry wideo. Zarys poetyki (Video Games. Outline of Poetics), Piotr Kubiński skilfully maintains a balance between comparing the singular phenomenon that video games represent to other forms of art while attempting to describe a new phenomenon using certain traditional categories, and underscoring their significant individuality and characteristic features. In searching for an adequate tool for studying the new phenomenon, the author analyzes multiple aspects of a variety of examples, examining such categories as immersion, emersion and the graphic interface of the user. He also raises the problem of connections between video games and other genres of art, doing so not only in the section dedicated to such comparisons, but throughout the book. His exemplification is aided by transparent and compelling illustrative material. The book appears to represent an important step forward in Polish studies of video games, particularly in view of the introduction and detailed discussion of the concept of emersion, but also due to the penetrating interpretations of specific artistic solutions and tropes. See, for example: G. Frasca, “Ludology meets narratology. Similitude and differences between (video)games and narrative,” http://www.ludology.org/articles/ludology.html, accessed: 28.01.2017; A. Surdyk, “Status naukowy ludologii. Przyczynek do dyskusji” (The Scholarly Status of Ludology. A Contribution to the Discussion), Homo Ludens 1/2009, pp. 223-243. P. Kubiński, Gry wideo. Zarys poetyki, Kraków 2016, p. 52. We may be given pause in this case by the question of whether a similar emersive effect can be produced by for example a printing error or linguistic mistake perceived by a reader during the course of an absorbing reading (for context, Kubiński mentions mistakes in films, such as the visibility in a shot of objects not germane to the represented world but to the real one, e.g. a coffee mug or a wristwatch in a historical or fantasy film). Tension between immersion and emersion is here outlined in a very striking manner – the degree of immersion can be limited by the effective impact of emersive factors (when following the plot of a book, it is not difficult to overlook a punctuation error, and following mistakes in films often demands a tremendous degree of attention to and concentration on technical aspects rather than aspects of the plot) – while in the case of video games “overlooking” emersive elements is not always in fact possible – because sometimes they make it impossible to follow the plot or continue playing.